There are lots of things in our life we take for granted and keep them in dark corner to be never appreciated. The reality kicks in when it is taken away from us. Going behind what you don't have will never keep your life satisfied, finding contentment in what you have is rather logical. The other day I was listening to the radio on my commute to work and heard about these students with cognitive and physical disabilities play music with the help of their music teacher who patiently teaches them to play music using ipad app. You could hear in the background the kids shouting with joy when they play the notes without a fault. It was really amazing to hear how talented those kids were and how the people who were around them had transformed their lives. As berries are abundant in this season, I made a small batch of strawberry with red wine jam couple of weeks ago. I had made this last year too and I love the taste. Since it has wine, I always make a small batch just for both of us. We have not done the berry picking yet this year. This time I would love to visit a blueberry farm and stock up some. We are looking forward for a farm visit with our friends soon before the season ends. 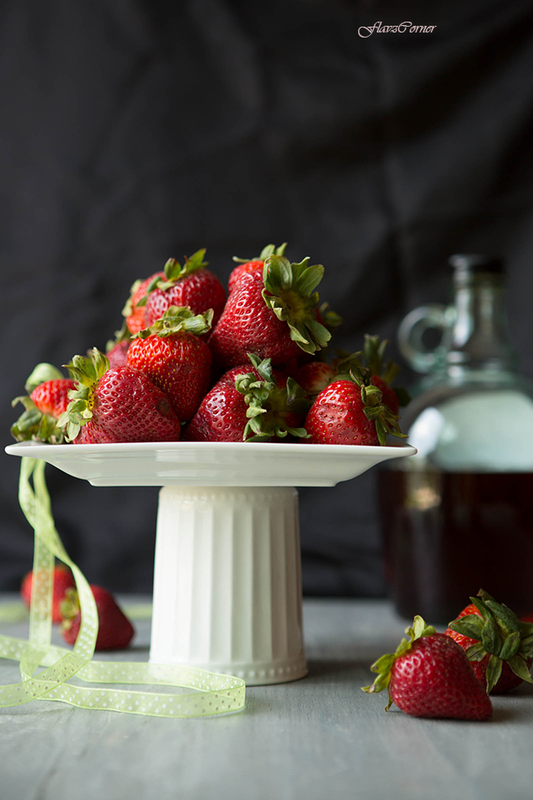 Mix the wine, sugar and chopped strawberries in a non-reactive or glass bowl. Cover and keep it in the refrigerator for 1 day. Strain the juice and cook it in a sauce pan till it gets into 1/3rd the volume and thickens slightly. Now add the strawberries and Cook for 10 minutes, use a potato masher to mash the strawberries and add lemon juice to it. Cook for another 10 minutes by stirring occasionally. Spoon 1 teaspoon of the jam on a clean cold plate (previously kept in the refrigerator). Gently tilt the plate to see if the jam got thick and its not runny. Turn off the burner and ladle the hot jam into sterilized jars. Secure the jar lids and let them cool. 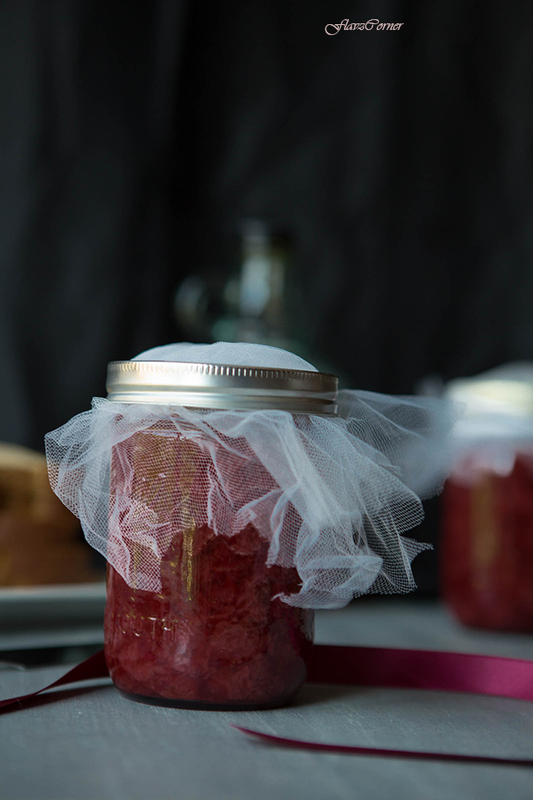 If you are not using the water bath canning method, refrigerate the jam immediately. If you try to cook the jam with the juice, it will take longer and the color of the jam will not be appealing. So reduce the amount of juice by cooking it separately as given in the directions. The opened jar of the jam should be kept refrigerated. If you want to keep the jam outside, follow one of the water bath sterilization technique. There are lots of YouTube videos available that shows the canning. Looks delicious. Love the shot of the berries. Red and luscious! Strawberry and wine...what a great pairing for summer jam! Great story. And I don't think I've ever had wine in jam before -- love the idea. Perfect recipe -- thanks so much. Thanx for dropping by,Happy to join your lovely space with beautiful clicks !! omg red wine and strawberry-the whole affair sounds so romantic:) so yummy eh! 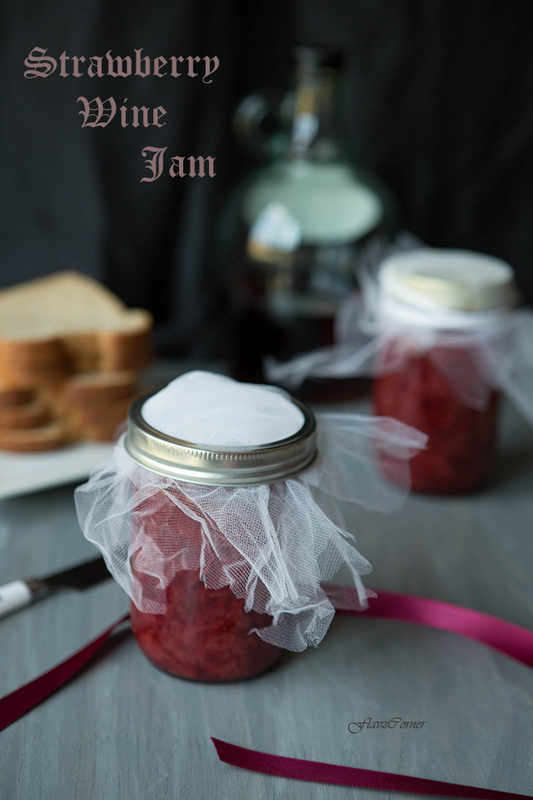 This strawberry wine jam sounds amazing!!! I love the flavor combo... must try! I have to go for our berry picking too...i loved the wine part in Jam, I will enjoy the small dose of booze with every slice of bread ! !